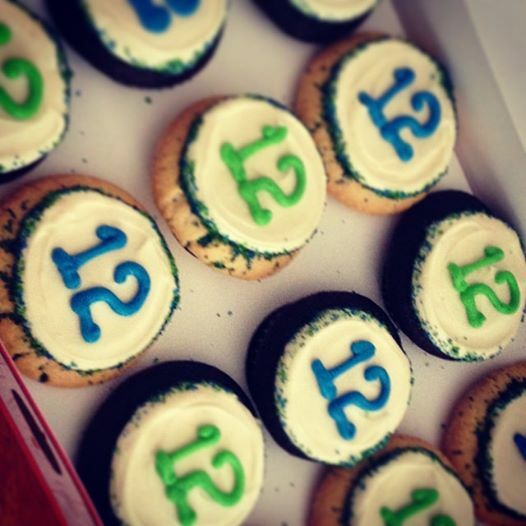 12th Man Cupcakes from Cupcake Royale. Yum. Now that I’m not in the classroom teaching college students (aka the world’s germiest people), I almost never get colds. When we got back from Vancouver, Z succumbed to one, which is always a sad thing because a) Z should always feel great and b) I am the world’s worst caregiver. I’ve got no real domestic skills, and so I spend way more time lecturing him on the merits of Kleenex vs. hankies instead of fixing him steaming bowls of chicken soup and fluffing his pillows. I once brought him borscht from the Russian pierogi shop up the street when he had a stomach flu, which I discovered is not a good idea. My most recent care-giving faux pas was just last night. He was suffering with a sinus headache, and so I gave him a head massage with Aveda Blue Oil (love this stuff!) and got some of its minty goodness in his eye. He spent the rest of the night blinking furiously. I kept insisting that it wasn’t the Blue Oil and my ministrations that had caused the trail of tears on his cheeks, but instead attributed it to the strong emotion he was feeling about a particularly dramatic song one of the Olympic ice princesses was skating to. All week, Z blew his nose and walked around the house wearing sunglasses for his headache and a furry blanket wrapped around his neck and torso, looking kind of like an eccentric drug kingpin. Meanwhile, all week I was crowing about my amazing immune system and how rarely I succumb to things like the common cold now that I’m not grading 400+ coughed-upon papers a semester. And then Saturday evening as Z was starting to feel like himself—the night before the big game and the little party we were having at which I planned to cheer on the Seahawks and hold (and hog) the new baby belonging to our friends—my nose started running. Boooo. BOOOOOO. If you’ve been wondering why there wasn’t a gloating post-Bowl post, it’s because I was either blowing my nose or napping for the last week. I am not really a sports fan, and most years when we watch the Super Bowl, I’m in it for the commercials. But this year I was surprised to discover that I’d caught a case of Seahawks fever. I still have no idea what “off sides” means and when the announcer says someone has “taken a knee” I expect to see the extra players praying on the sidelines, so I’m not claiming to be a #1 fan here. But when you live in a city with a team and see some of the players on the cheesy local commercials for things like plumbing and when you can hear the touchdown cannon go off whilst sitting on your very own sofa, it’s hard not to feel . . . involved. Plus, I’ve discovered via the magic of the interwebs that the Seahawks are one of the most disliked teams in the country, and for some reason this makes me feel kind of protective of them. They’re clearly loved here—there has been a gross misappropriation of office Post-Its to make 12th Man flags in blue and green in the windows all over town—but mention the Seahawks to someone outside of Puget Sound and you’ll see actual lips curl. Obviously, the Seahawks were not depending on me so my cold didn’t really affect the outcome of the game, but I did miss out on serious baby-holding time. The baby in question—who I will call Pippi (as in Longstocking) here because she has a hint of red hair, Scandinavian heritage, and what I believe will be a fierce heart and vivid imagination—still came over, but I had to just sort of peer at her in her little Seahawks onesie from a distance and promise not to sneeze in her general direction. As it turned out she only spent the first half of the game with us as her parents decided that Baby’s First Super Bowl was slightly less important than Baby’s First—and probably only—Trip to Costco When No One Else is There. Because they left us with half a dozen 12th Man cupcakes from Cupcake Royale, I forgave them the early departure. Since we only live a few blocks from the victory parade route, Z and I decided to pop down to see a little of it on Wednesday before he had to head to work for a meeting. I still had a cold and it was freezing out, but it was sunny so I put on extra layers of clothes, including two hats, and off we went. We stood half a block from the parade route and waited. We watched people. We waited. I checked my email. We waited. Then we got word that the parade was going to start almost an hour late. Z had a meeting to go to and my nose was starting to run more furiously, so we posted a photo of ourselves “at the parade” on Facebook and trudged back up the hill, feeling a little dejected to miss out but also a little relieved to be heading back into the warm. Z went to work and I curled up in my chair under a blanket and watched the parade on TV. A parade without floats and drill teams just does not engage me. 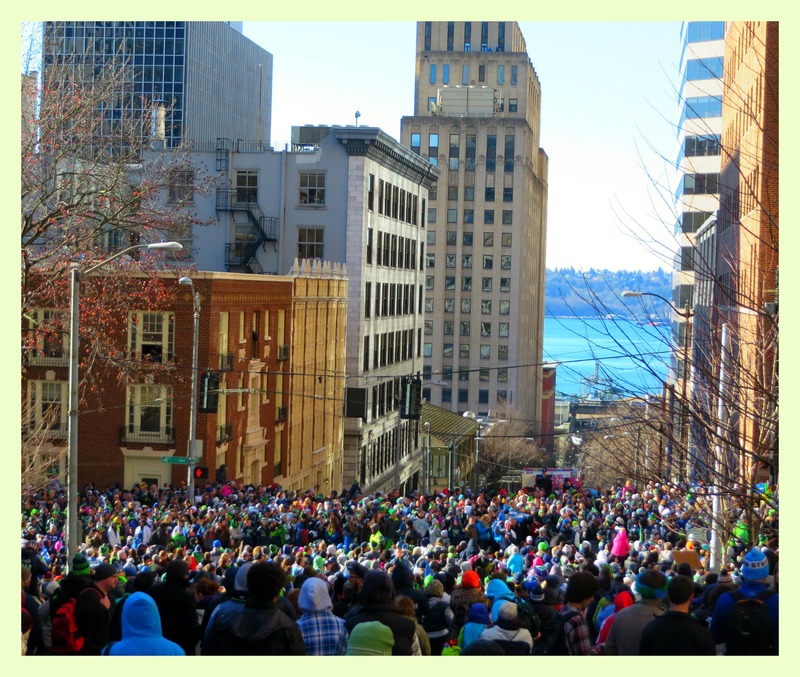 I want scenes made of roses or giant balloons, but this parade involved only the Seahawks and their entourage riding around on the amphibious “Ride the Ducks” tour busses, throwing Skittles and beads to the crowd. The game was over, and as I watched people on TV scream and climb trees, I couldn’t remember exactly what all the fuss was about. My brain started asking big questions, like, Would there be a parade this frenetic if this were a women’s football team? Or, Would there be a parade if someone from Seattle won the Pulitzer? After half an hour, I was bored and had my nose stuck in a book. I’m not sure what my prognosis is. The Fever has subsided for now, but there’s a possibility it will return in the fall. We’ll have to wait and see. Crowd waiting for the Seahawks victory parade. I have always believed that pampering invalids only encourages them to keep being poorly. You did the right thing; Z will not be wanting to have burning oil rubbed into his eyes again. A good policy! I just hope he doesn’t adopt it as he tends me nicely when I’m sick. Yes, but really, wasn’t it great? Such an “upper,” for all Seattle to be happy! Whoo hoooo!!! I am about to be healed by the sunny warmth of California. Thank you!